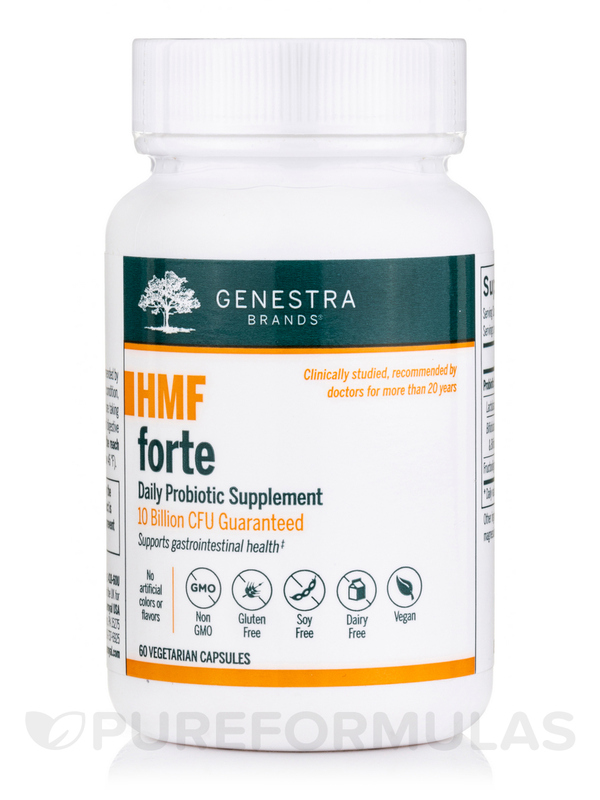 I have stopped eating dairy which as included dairy so the HMF Forte is a great way to get probiotics and good cultures that I was getting from my yougert. My natural path doctor recoomended HMF Forte and Im very sastified. I use HMF Forte by Seroyal to re balance during a course of antibiotics and it keeps me free of digestive yeast and secondary infections. Highly recommend this product for someone looking for a great probiotic for gut maintenance! Do you get enough probiotics in your daily diet? For many people nowadays‚ the answer is no. They’re contained in a variety of foods and drinks: yogurt‚ miso soup‚ fermented vegetables like cabbage‚ kefir‚ and tempeh. A lot of manufacturers are also enriching their products with additional probiotics. Even then‚ you may still not get enough of the healthy bacteria your digestive tract needs. Consistency is an essential part of any nutritional regimen. A convenient supplement‚ such as HMF Forte Vegetable Capsules‚ lets you simplify your routine into taking two capsules each day. 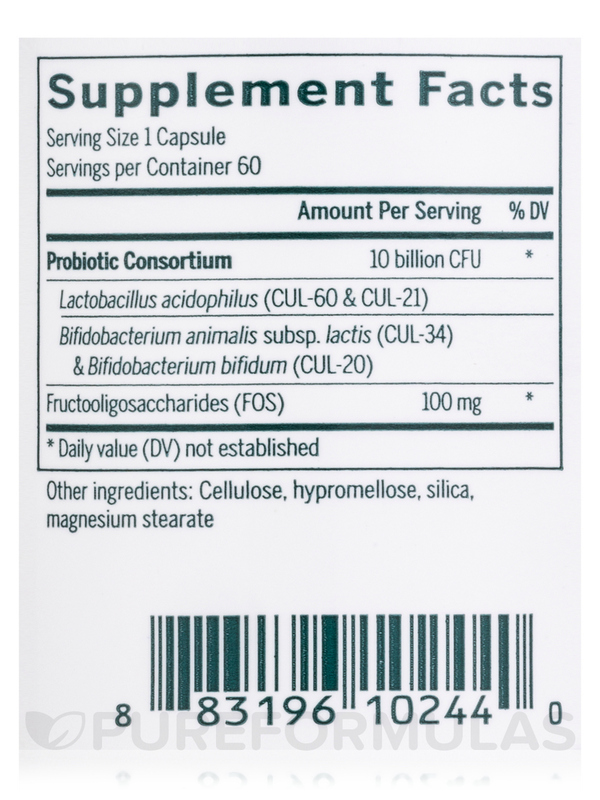 HMF Forte provides two strains of lactobacillus acidophilus: bifidobacterium bifidum and bifidobacterium lactis. They are assisted by fructo-oligosaccharides in fighting the unhealthy bacteria that allow pathogens to enter your body and compromise your immune system. In addition‚ this combination promotes a healthy balance of bacteria in your digestive system. Studies point to the potential positive effects of probiotics on intestinal health. They may contribute to relieving constipation‚ diarrhea‚ and colitis. Good news if you’re lactose intolerant: some probiotics produce lactase‚ which allows the body to better digest and absorb lactose. It’s also thought that probiotic supplements can help reduce inflammation. HMF Forte is a high-level maintenance formula especially suited to you if you take oral contraceptives‚ antibiotics‚ steroids‚ or other hormones that interact with normal probiotic supplements. It’s also recommended if your immune system has been compromised due to any diseases. 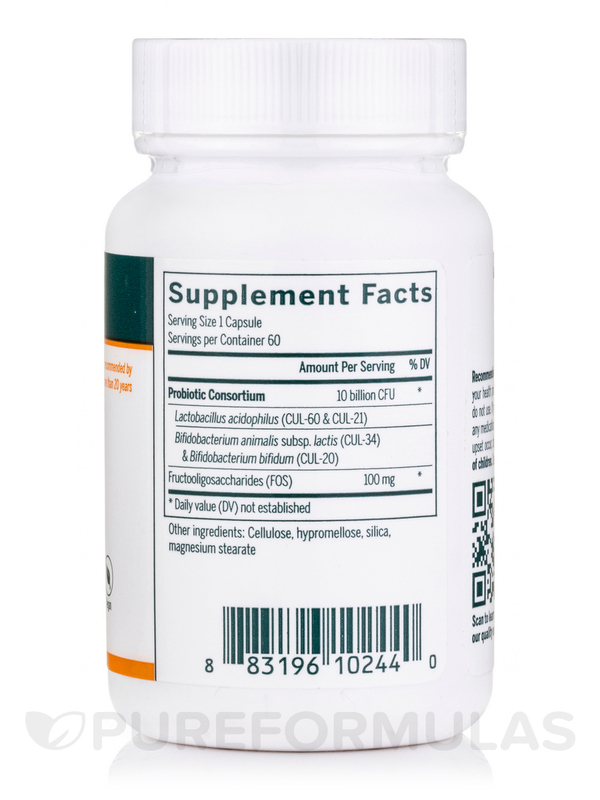 HMF Forte is an ideal supplement for vegans‚ because Seroyal has made sure that 100% of the material that goes into making these capsules is sourced from vegetables. 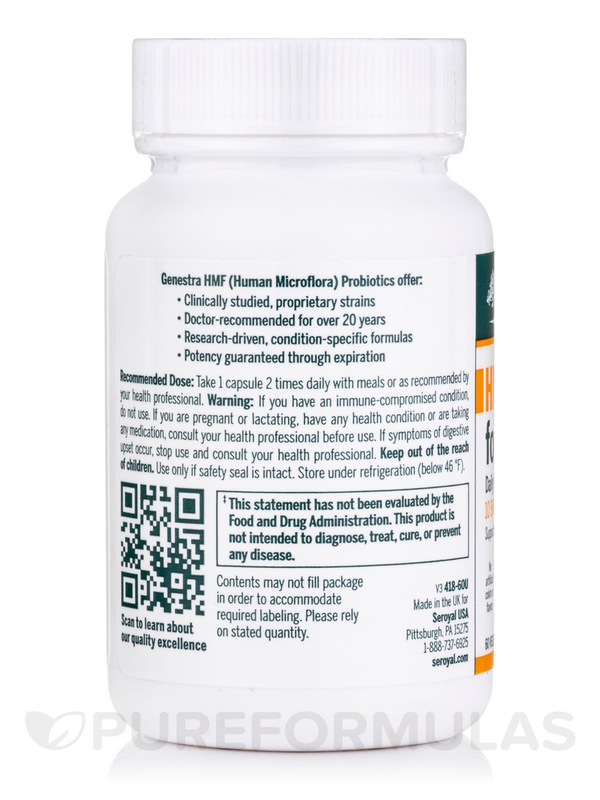 Probiotic supplements‚ such as HMF Forte‚ last for up to six months without refrigeration and are travel-safe. However‚ if you want to keep them fresh for longer periods of time‚ keeping them in the refrigerator or freezer is advised. 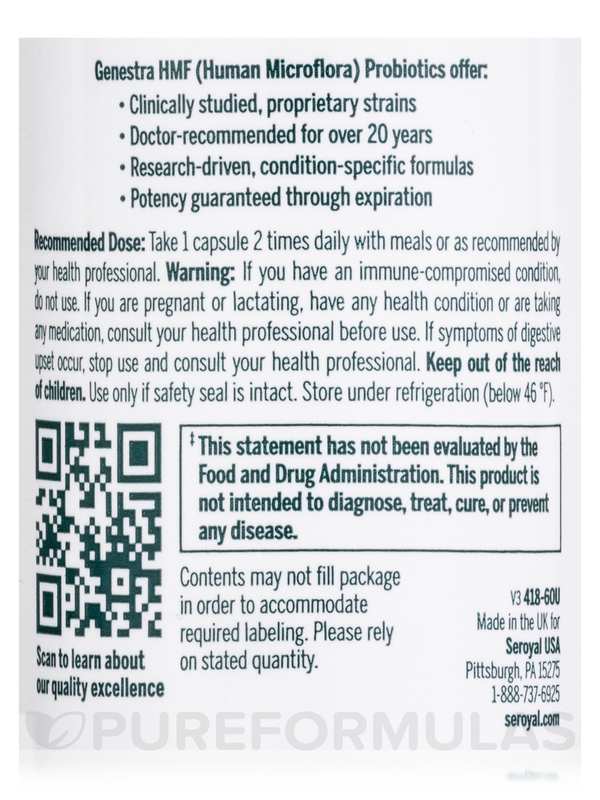 This bottle offers a 30-day supply of HMF Forte at the recommended dosage. Other Ingredients: Cellulose‚ hypromellose‚ silica‚ magnesium stearate. Guaranteed to contain no added wheat‚ starch‚ gluten‚ soy‚ artificial coloring or flavoring‚ antimicrobial preservatives‚ dairy or animal products. The capsules are made from 100% pure vegetable sources‚ free of preservatives and additives. Adults and Children (6 years and older): Take one capsule two times daily with meals‚ or as recommended by your healthcare practitioner. If you have an immune compromised condition‚ do not use. If you are experiencing nausea‚ fever‚ vomiting‚ bloody diarrhea or severe abdominal pain‚ consult your healthcare practitioner prior to use. If symptoms of digestive upset occur‚ worsen or persist beyond three days‚ discontinue use and consult your healthcare practitioner. Safety sealed for your protection and for product freshness. Do not use if outer seal is missing or broken. Store under refrigeration (below 46° F). I have tried many probiotics and HMF Forte by Seroyal seems to work best for me. Its easy to take and really works. I think you should try this product! It works. My stomach is now calm without the bloating and gas. It has cellulose in it. Feel like HMF Forte by Seroyal has the quality worth the money! I take this daily to help keep my crohns and UC in check. I was taking the Jigsaw product but HMF Forte is less expensive and more effective. I spoke with several naturopaths and did extensive research including attending lectures from a professor on nutrition before deciding on HMF Forte. It is one of the few on the market that comes cold to assure the stability of the culture. My Naturopath recommended HMF Forte by Seroyal and it seems to work well. I dont have a lot to compare it to but I am pleased. I have been using HMF Forte by Seroyal for almost 2 years. It has really helped to build the good bacteria in my gut after I long 2 year stint in Africa. My ND recommended HMF Forte and I've been very happy with the results. Is this product stored under refrigeration? Will it be shipped in cold packs?